The cost saving series of High Street posts continues this week as we look at how you can avoid spending a fortune on all your wedding stationery and invitations. Our wonderful wedding planners here at Woodhall Manor have gathered together their pick of the best stationery that will look fabulous, but cost a fraction of the price of bespoke wedding stationery. From name cards and table plans to invitations and save the date cards, Debenhams has all your wedding stationery requirements covered with plenty of choices. Whatever the style or theme of your wedding, you’re sure to be able to find something to suit from their broad range of designs.  Their ranges are grouped into themes making it really easy to identify what you like from styles such as Traditional, Glamour, Contemporary Chic and Sparkle. You don’t have to worry about handwriting all the details either as you can personalise your invites with all the key information, so once they arrive all you have to do is pop them in the post. 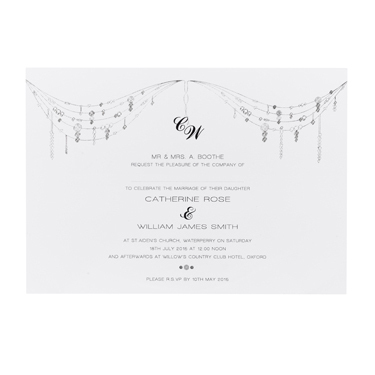 Our favourite is the ‘Charmed’ design which is a classic white postcard complete with foil detailing and your initials entwined within the design. All personalised invitations are delivered with complementary envelopes and a set of 100 will cost you £127. For those couples who are quite happy to write their own invites, then we think you should definitely check out the range from Paperchase. They have some lovely quirky designs that add an element of fun to your wedding comms! We think the DIY Scratch and Reveal invites are the best we’ve seen in a long while. You can hide the key details of your big day such as the location and times under gold panels which guests then scratch off to reveal your plans. Not only are these great fun, but they’re also a proper bargain at just £6 for 10 invitations and envelopes, meaning a set of 100 will cost just £60! You can also purchase complementary save the date cards and evening invitations giving the look and feel of bespoke designed wedding stationery, without the heavy price tag. For a traditional style invitation without the traditionally high price tag, then you can’t go wrong with John Lewis who offer a great range of classic wedding stationery that can be personalised for your wedding. We love the fact that this range also includes information sheets in matching styles so that you can provide your guests with all the additional info they need such as timings, maps and accommodation listings. 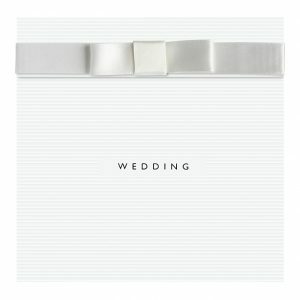 For us, it’s the simplicity of the CCA White Invitations with satin bow detail that get our vote. Available to order both in store and online, you’ll be sent a proof to check before your order goes to print to ensure every detail is accurate. An order of 60 personalised invitations together with envelopes will cost you £174. Our last, and possibly most tempting High Street option comes from the fantastic Hobbycraft that has some gorgeous options that represent our most cost-effective find. Their range includes save the date cards and supplementary information sheets and evening invites so you can sort your entire wedding stationery suite in one place. 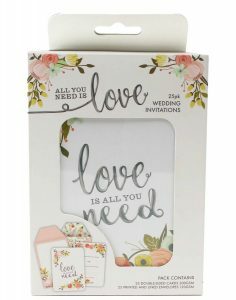 We love the All You Need Is Love range that has a stunning floral design that would work perfectly for a summery English country wedding. The cards are printed on a heavyweight card so feel like they’re a good quality, and the envelopes are both printed and lined. With a pack of 25 costing just £9, we think these just can’t be beaten – that’s just £36 per 100 invitations! We hope we’ve given you some great inspiration for your super stylish wedding stationery, but for more advice on planning your wedding, why not give our experienced wedding planners a call today. While you’re at it, you could arrange a private tour of our stunning country manor house. Give us a call on 01394 411 288 or email info@woodhallmanor.com to find out more about Woodhall Manor.